In the Northern Malian region of Gao, Adoum looks at his phone. It's time to go find greener pastures for his herd. He has a few spots in mind but needs to gather more information before embarking on the weeks-long journey. "To decide where to go, pastoralists typically pay an emissary to check out the area they have in mind as their next destination, and report back. It takes at best a few days to get the information by motorbike, weeks if the journey is undertaken by camel. 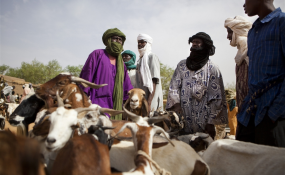 It is costly, slow and risky," says Abdoul Aziz Ag Alwaly, Head of Programmes of local non-governmental organization TASSAGHT who works with pastoralists in the Sahel. He is also a founding member of the African Network of Pastoralists, Bilital Maroobé. Thanks to mobile phones, this information is literally at their fingertips. Adoum is one of 21,000 pastoralists who use the Garbal mobile phone service to find where the best conditions are to move their herd. Garbal, a service privately operated by telecom company Orange Mali, was established by the Sustainable Technology Adaptation for Mali's Pastoralists (STAMP) project in November of 2017. It aims to improve the resilience of pastoralists to climate change through the access and use of geo-satellite data. Satellite images are often not complete enough, however, so the multi-partner project, funded by the Government of the Netherlands and executed by SNV Netherlands Development Organisation, has anchored verification of information in the communities, enlisting villagers to check the quality and relevance of the information provided by the satellites. For example, a water source that appears on the map after rainfall may be one that will not last more than a few days--shorter than it would take a pastoralist to get there. The Sustainable Technology Adaptation for Mali's Pastoralists project isn't your typical public-private partnership. It's a government-multinational corporation-grassroots organization joint (ad)venture. "We worked with the communities' leaders to select a couple of people per site, then we trained them on how to collect data and send it to us for validation, before getting it to the Orange Mali call centre people," says Alwaly. "We invited some of these pastoralists for a training in Bamako. Some of them had never been to the capital; they felt like pioneers walking uncharted territory, discovering new technologies," says Catherine Le Côme, the SNV Netherlands Development Organisation coordinator of the Sustainable Technology Adaptation for Mali's Pastoralists project. "It has been absolutely amazing to get such different people to work together towards a common goal." Launched in Gao one year ago, the Garbal service has been highly successful--98 per cent of users are satisfied or very satisfied with the service and 97.6 per cent praise the accuracy of the information. "The first phase of the project closed in December 2018, but given its success, we are now looking to expand the service to other regions in Mali and beyond, and add services of relevance to pastoralists such as animal health counselling and digital financial products." "Water scarcity is one of the most pressing challenges we are facing today, and ensuring access to abundant, safe, clean water sources is a great challenge, particularly in arid and semi-arid environments," says Lis Mullin Bernhardt, freshwater expert at UN Environment. "Projects such as this one are a great complement to UN Environment's work on managing freshwater ecosystems and helping communities affected by severe droughts. Further, we consider satellite imagery a powerful tool to assist countries in monitoring and implementing the Sustainable Development Goals (SDGs), particularly by using earth observations in the context of the water-related goal, Sustainable Development Goal 6. "